Evan is a male aged 20, 5′ 6″. He went from 180 lbs to 140 lbs, BUT now…. His first 33 were from dietary changes alone, the last 6.5 lbs he introduced cardio. (he got a stationary bike). Why isn’t fat melting off of his stomach yet? Do you aspire to a certain body shape? I guess we all do. The bad news is that genetics dictate certain things. The good news is that we do have the power to change some things. We can’t change our bone structure, and the way our body burns fat in specific areas is also something that is unique to us. Check out these inspiring folks who have found the answer. Do you find when you lose fat it disappears from the places you want to stay big? Maybe it stubbornly holds on to the places you really want to slim down. Some of the books we’ve read tried to sell us “spot reduction”. It’s a myth. We cannot choose to burn the fat on our waist over that in our face. We have adipose tissue all over the body. This tissue is made of adipocytes (fat cells) whose sole job is to store energy in the form of fat. Body fat distribution differs from person to person. subcutaneous (beneath the skin – about 80% of all body fat is this type (src)). Does eating fat make you fat? We get to the bottom of that myth here. Where Do We Gain Fat? Women – around the buttocks and thighs (gluteofemoral): “pear-shaped”. Men – around the abdomen: “apple-shaped”. 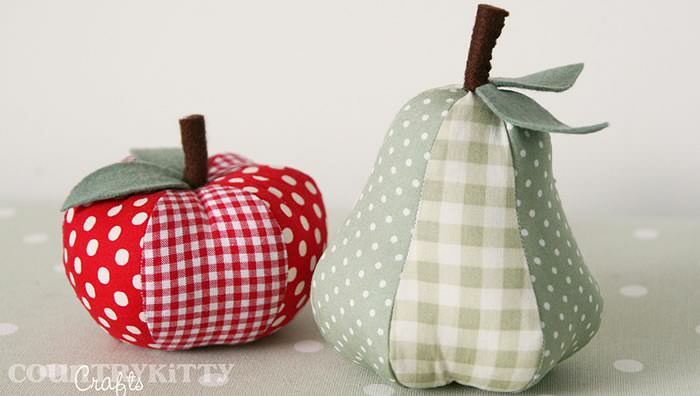 These are the predominant patterns – but both ‘apple’ and ‘pear’ shaped distribution can be found in either gender. Upper Arm Common in women, fat build up can occur in the middle to upper area of the upper arm – typically covering the tricep area. Some women elect to have arm liposuction procedure to remove fat from this area without the marks caused by surgery. Buttocks Without fat here – sitting would be quite uncomfortable. Fat is held in place by the gluteal fold. If significant fat is lost from the buttock, only appropriate training can prevent the buttock from sagging down against the thigh. Chest Breast tissue comprises the mammary gland (one’s ‘endowment’) surrounded by fat. Men also have atrophied glands and fat in this area. Both sexes gain fat in this area. In men this can sometimes be mistaken for gynecomastia – a condition that includes not only fat build up, but growth in gland tissue. There is considerable research showing that fat distribution varies between ethnic groups. 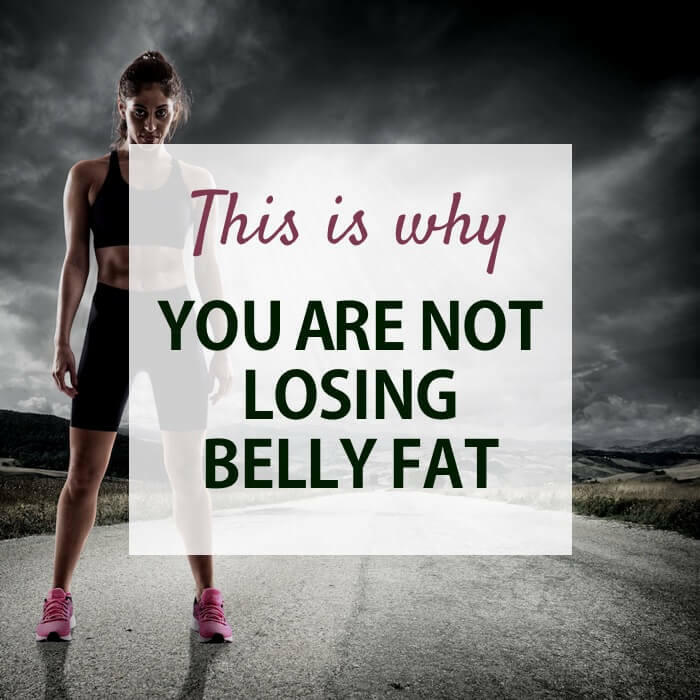 However, in some people there are localized areas where fat loss (and gain) is more pronounced, and while fat is still shed from all over the body, the loss is proportionately different in different areas. This is why a man can get thin in the face – and yet still have a small ‘spare tire’ around his waist. Or a woman may complain of a smaller bust, and yet her hip size has dropped only a tiny amount. White areas are fatty tissue. 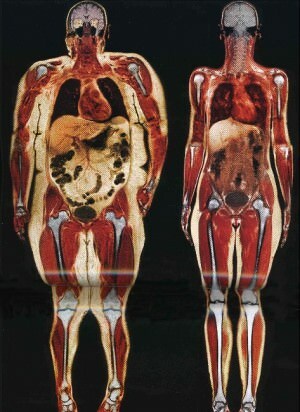 The person on the left has fat surrounding internal organs. This is further compounded by cellulite. With cellulite tissue, fatty acids are contained in a net of fibrous connective tissue. Why Do I Lose Weight But Look the Same? Obese men tend to lose more visceral (internal) fat while obese women lose more subcutaneous fat (src). Diet alone results in more visceral fat loss (and less surface fat loss) (src). This explains how you can lose weight – but not necessarily have any radical change in appearance. There is very little you can do to influence specific subcutaneous fat distribution. High-repetition (e.g. 20-30 reps) weight training will not lead to greater fat loss. In fact the loss of intensity may ultimately result in less fat loss than lower-reps with heavier weights. Higher reps are good for muscular endurance (more). Switch Up Your Diet. If you have been in regimented plan and your fat loss has stalled, it may be time for something different. You May Not Be Eating Enough! Learn why low calories could be sabotaging you here. It can be very frustrating but everybody is different. Stay committed to your training and nutrition – and don’t be dissuaded by the commercials and images that show perfectly proportioned clones. I’m at a stall. I lost ten pounds, now no matter what I do can’t break it. Work out every morning,cardio for an hour, eat low carb no sugar. In ketosis the whole time. I do see a difference in how my clothes fit and feel though. Is there something I’m not doing? Need 25 more pounds gone. Hi Barbara, It sounds like you may have slowed your metabolism from a long period of undereating while exercising. Give this article a read and see if it resonates with you. hey. I’m 16 and 80kg.. my whole is getting fat day by day.. chest, armpit,legs and specially belly and face. but I even don’t eat much.. facing a lot of problems related to weight these days.. any surgery,treatment or solution to solve this? please help.. seriously in need. I’m 18 years old, I’m 5’6 1/2, and 132 pounds.. generally I would say I’m on the thinner side.. however my stomach and love handle area are horrible. Even when I was at my lightest weight (118), which is nearly underweight for my height, I still had horrible love handles. I don’t know what to do or how to get rid of them. Even though the rest of me is generally thin, my stomach area is not.. does anyone know what I can do? Do you do core/ab work? A bigger stomach can be caused by weak lower ab muscles that allow your internal organs to push out. Conversely, if you overtrain your Obliques (love handles) they can become bigger and be more pronounced. Wait so a friend told me you lose more fat by eating less, or healthy food than to exercise. Is this true? Diet is about 85% of the recipe for fat loss, exercise is the other 15%. You always have to have your eating in check before you can count on sustainable results. Hi, I am 62 years old, have the last 2,5 year lost about 55 kg. I am 183,5 cm tall. Now I see a slight six pac. All due to low carb, 30% protein from eggs, fatty fish and lamb, pluss real butter and virgin olive oil. Keteonic diet and also OMADD, one meal a day, I eat about 3500 calories, feel full all the time and become stronger using my Bullworker and Convict Conditioning for an hour 3 days a week. Why we are fat and what to do about it. This is so true! I am 52 and lost 32 lbs in 6 months going low carb/sugar. I FEEL 100% better! With better eating habits, good nutrition, and exercise my cholesterol dropped into the normal range and I can run 5 and 10Ks now.